Black Ice software has just release the Printer Driver version 11.02 with several new enhancements and features! Additionally, the PDF printer driver includes major improvements for font embedding and font management for reduced file sizes, as well as the significant improvements to the HTML file generation (Color and ColorPlus only). When embedding fonts into a PDF document it is possible to include only those characters that were used in the document. This partial font is called is a "Font Subset". From version 11.02 Black Ice PDF and ColorPlus drivers support font subsetting which greatly reduces output PDF file sizes. Only TrueType and OpenType fonts will be subsetted. Font subsetting can be set through the INI file [PDF Settings] section. Subset font=1 // this is the default setting. Fonts will be subsetted. The GetPdfCreateSubset function will return the state of the font subsetting. If the returned value is TRUE, all embedded truetype/opentype fonts are saved as subset. The SetPdfCreateSubset function can set the state of the font subsetting. Font embedding can also be set for HTML output. 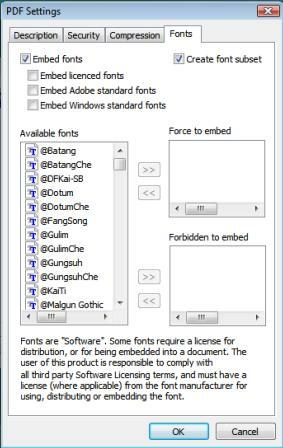 In the HTML Settings window the embedded fonts can be specified under the Fonts tab. Those fonts which are selected for embedding will be placed next to the HTML output file with the same name as the original font. Also, one full length html file can now be created instead of creating an html file for every page of the document. Output Filename is now available in the Black Ice printer drivers as possible parameter of the Start Application program, as well as as well as the ability to set output directories based on Environment Variables, eliminating the need for individual user configuration!